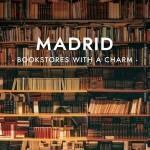 If there’s one thing people from Madrid are really proud of it’s the city’s sky. That shade of blue is absolutely unforgettable, it’s deep and intense and shinny and it doesn’t disappear during winter (insert standing ovation here). Edited by & illustrated by Ana Laya. 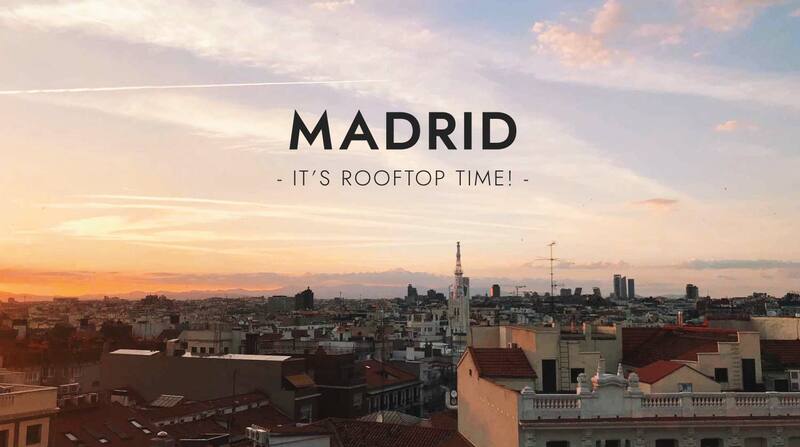 With that being said, it’s fair to add that “rooftop time” is all the time in Madrid, given its wonderful clear skies with little to no-rain forecasts all year long (Madrid is a desert, when it finally rains people is thankful, isn’t that a wonder?). 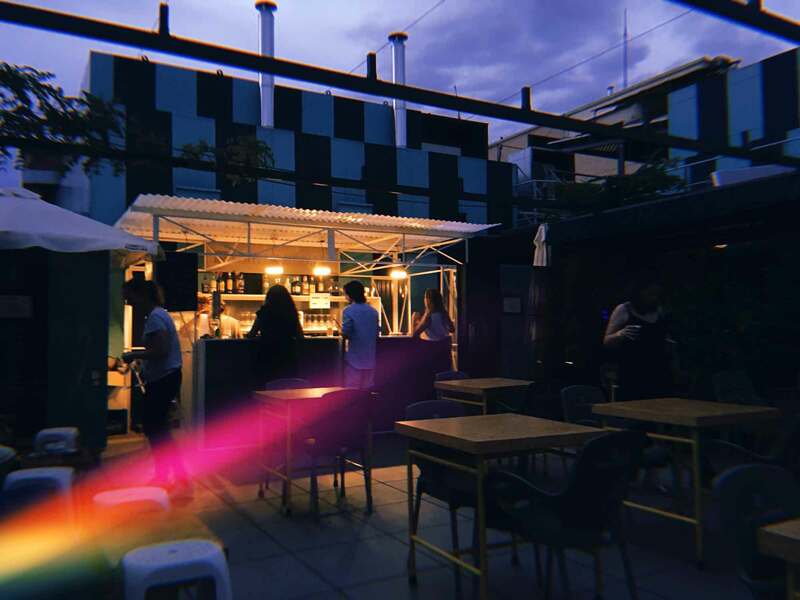 But obviously when it’s warm outside and we have summer specials and a relaxed holiday mood and when happy hour comes up to two hours before the sunset… enjoying the city a little bit closer to the sky can be dreamy. 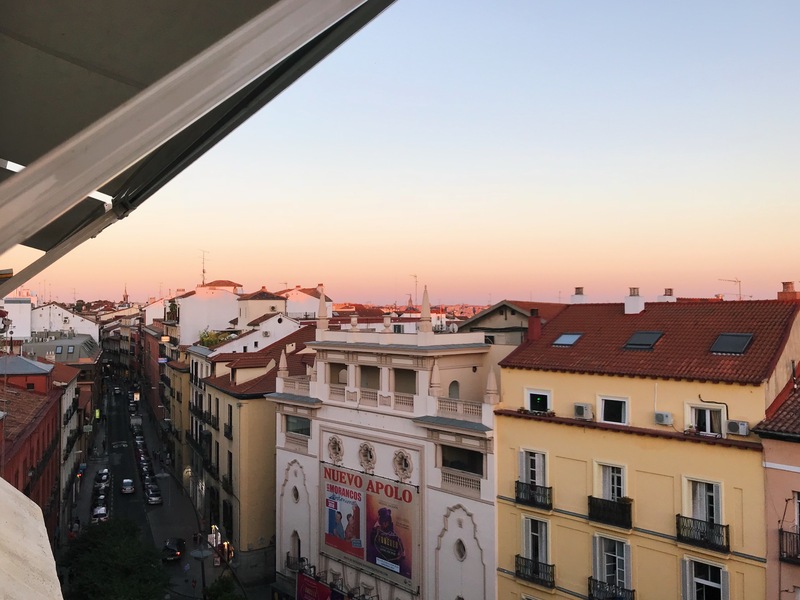 This minimap will show you seven different rooftops terraces in Madrid that are not the same that every travel guide mentions (not that there’s anything wrong with them, but someone already did that job). Each and every one of this terraces is special for a different reason and there’s one for every taste. Enjoy them! If you’re staying in Chamberí neigbourhood, then this is your local rooftop. 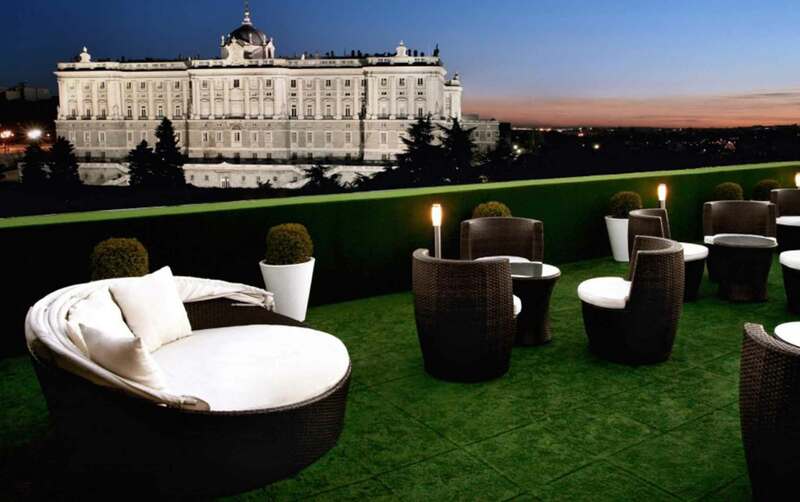 A modern terrace, located on top of the Exe Moncloa Hotel. 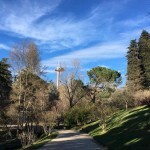 You’ll have a look at not so typical views of Parque del Oeste, one of our Unconventional Musts in the city, the Faro de Moncloa, Parque del Oeste, Ciudad Universitaria, El Pardo and finally the Sierra de Guadarrama. Yes, this is where the city ends. Also, being a bit far from the center means: it’s not so crowded. Enjoy! Sunset at Poniente. 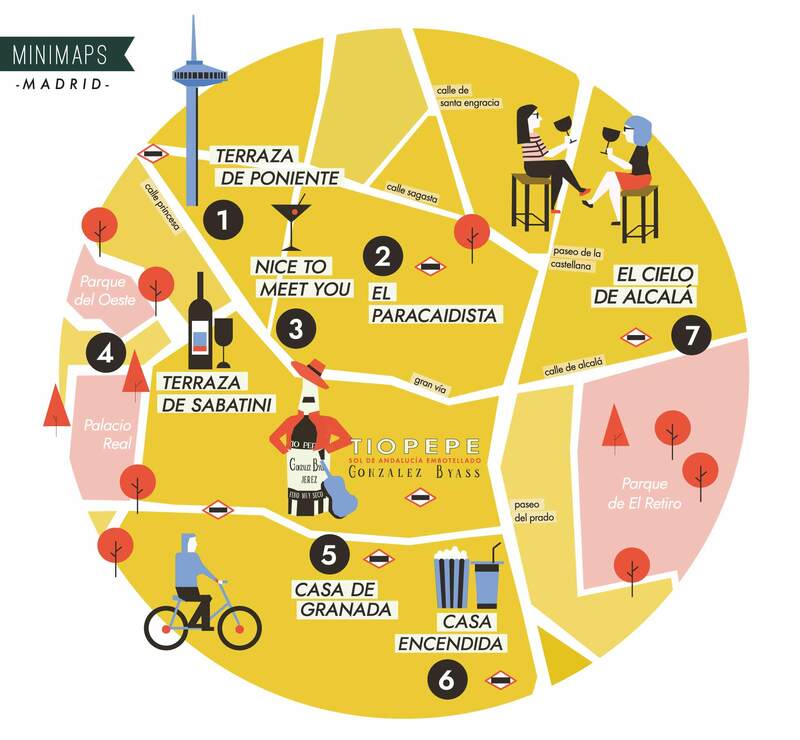 Foto: Minimaps. 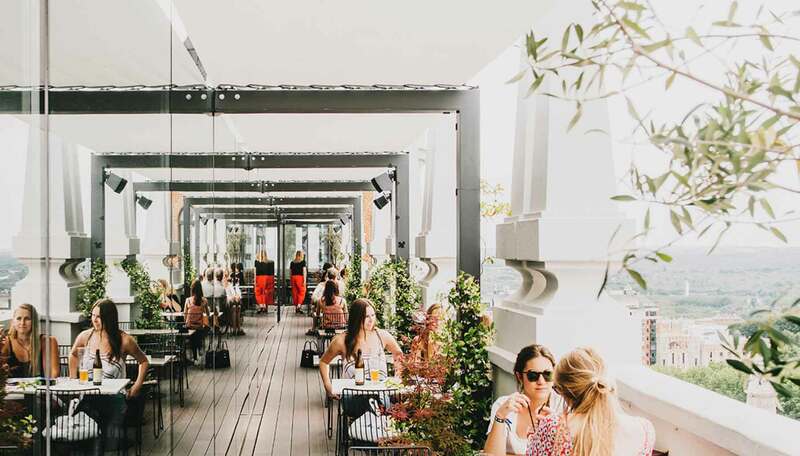 This bar and restaurant is located on top of the lovely Dear Hotel. It’s a urban garden or sorts with a laid out vibe. 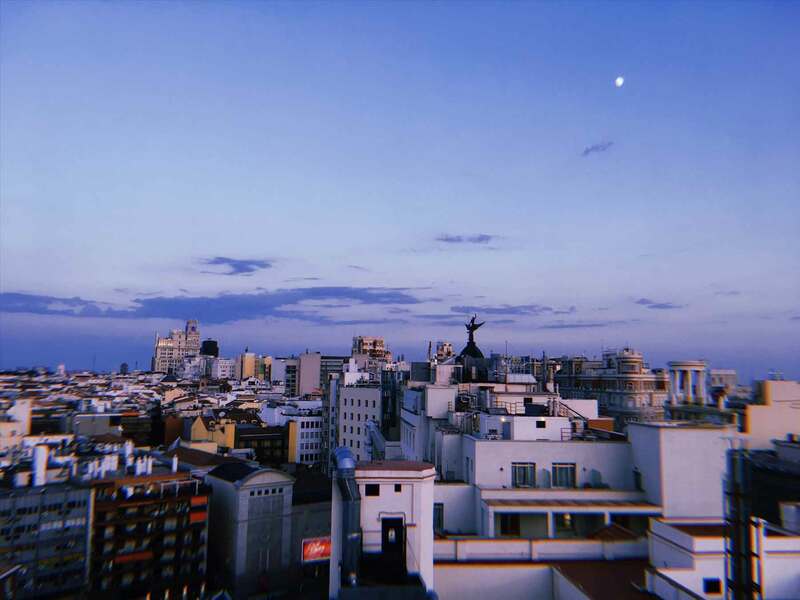 You have 360 views of the city, as it is on a 14th floor, very high for Madrid, so you can enjoy the wonderful Plaza España with the Casa de Campo and part of la Sierra on the background, that’s where the sun sets. 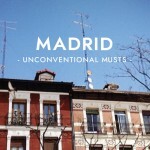 You can also enjoy part of the Gran Vía and the top of the most iconic buildings. 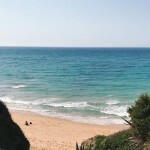 You’ll be surrounded by a young-ish, hip, relaxed crowd and the people staying in the hotel. They have DJs on the weekends. Cocktails are €12 and beers €4.50. You can make your reservations for the restaurant (located right below the terrace and still with gorgeous views) by phone or email. This is the restaurant | Photo vía Dear Hotel. This is part of the view from the terrace. Photo: Minimaps. This lovely building used to be the Royal Factory of Wax in 1788 and it’s located right in the middle of Malasaña where there are not many rooftop options. You’ll have a view of the cute, quintessentially Spanish rooftops of the old houses around. There is a concept store in the ground floor that sometimes turns into a gallery, there’s also a cafe/bar, a supermini-cinema and many activities all year long in the showcases located in the middle floors. 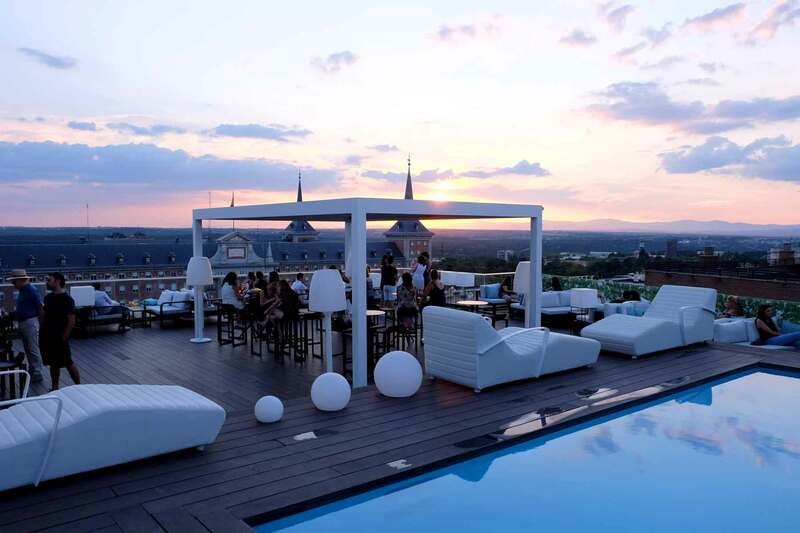 Booking for the rooftop is recommended during the summer. Open: Tuesday to Sunday from 12:00 to 00:00. This is the top floor of a great building with loads of stuff happening all the time. | Photo via El Paracaidista. This rooftop made the cut because that view is hardly found anywhere else. 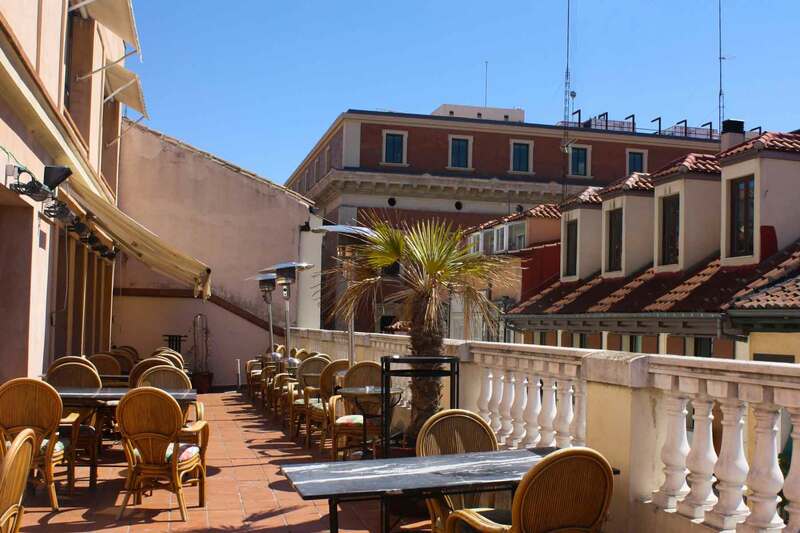 The Terraza de Sabatini, located on top of Jardines de Sabatini apartohotel and is right in front of the Royal Palace. 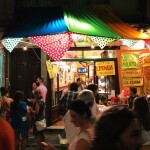 There’s a minimum spending per person required, something that I’ve learned by minimapping around that is not so unusual in these kind of places during summer, but it’s only 9€ the equivalent of a cocktail. Cheers! Photo via Terraza de Sabatini. 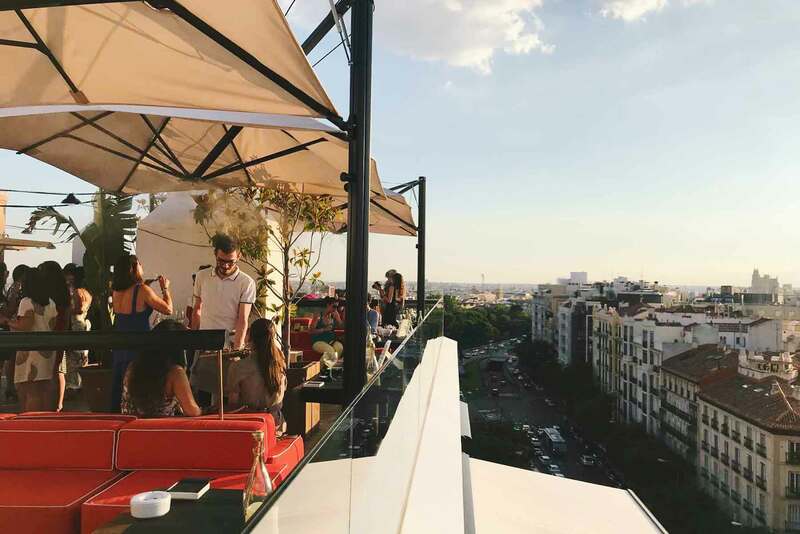 This peculiar rooftop is the most Spanish in the list, it’s not a non-place sort of say as it couldn’t be anywhere else but Spain. In Casa de Granada they don’t care about trendy lightning and “signature cocktails”, they offer cold beers, tasty tapas and dishes that are as delicious and generous as in Granada. 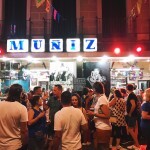 Sometimes they host live music events, generally classic music and flamenco. Have a leaflet there if you’re interested (not very strong online presence). Oh, and don’t expect a big ad on the ground floor of the building, just a small sign on the intercom. You ring, they open. Voilà. 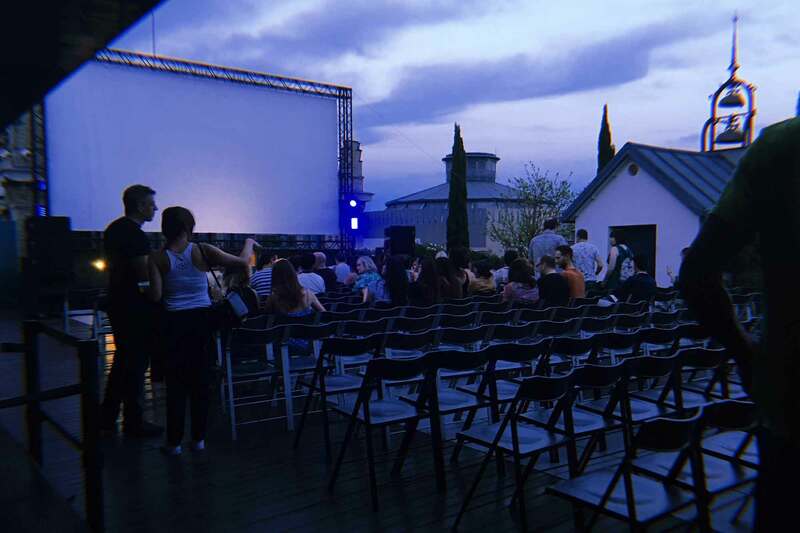 A drink and an indie movie or concert outdoors? Yes, please. 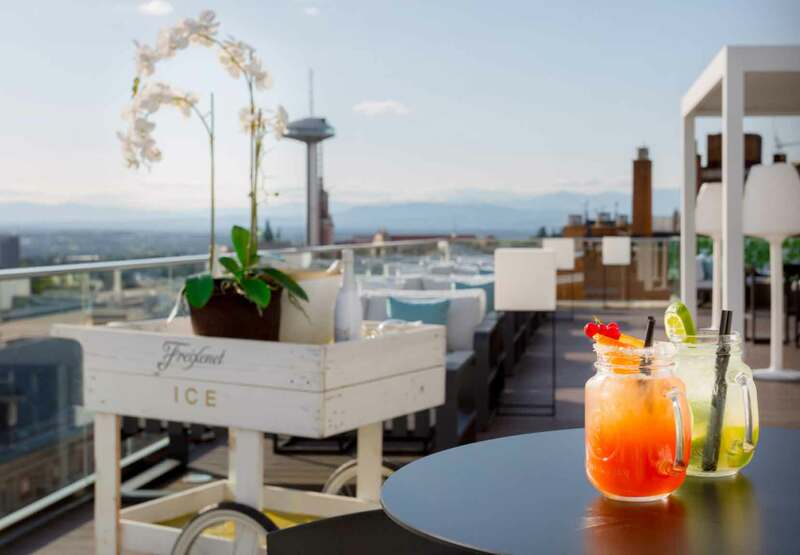 This rooftop is located on top of La Casa Encendida, a modern multifunctional centre with contemporary art exhibitions, workshops & fair trade shop. You’re still on time to enjoy some of this year’s program (including the Gus Van Sant exhibition until September 16th). Have a look! And don’t worry, the rooftop will still be there for you to enjoy a beer after visiting the nice and always interesting Casa Encendida. The fresh rooftop. Photo: Minimaps. This is a truly hidden jewel, because judging by the height of the building you’d never tell that such amazing views await. 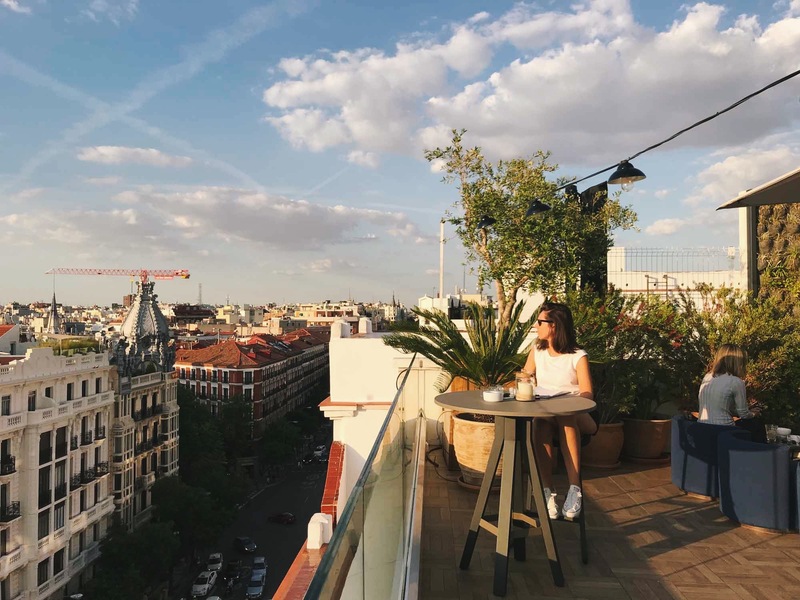 All of El Retiro park is right there for you, followed by la Puerta de Alcalá, Gran Vía, and to your right hand side the entire Salamanca neighbourhood extending at your feet. Fancy and delicious drinks and a tasty tapas menu that they usually update seasonally (they have now a 3-mini-burger dish that is really really good… and not only because we love all things “mini”). If you’re a gin tonic fan, try their special made with aloe vera gin straight from Formentera island (Ibiza). Overlooking Salamanca neighbourhood on one side and El retiro on the other side, this is El cielo de Alcalá. 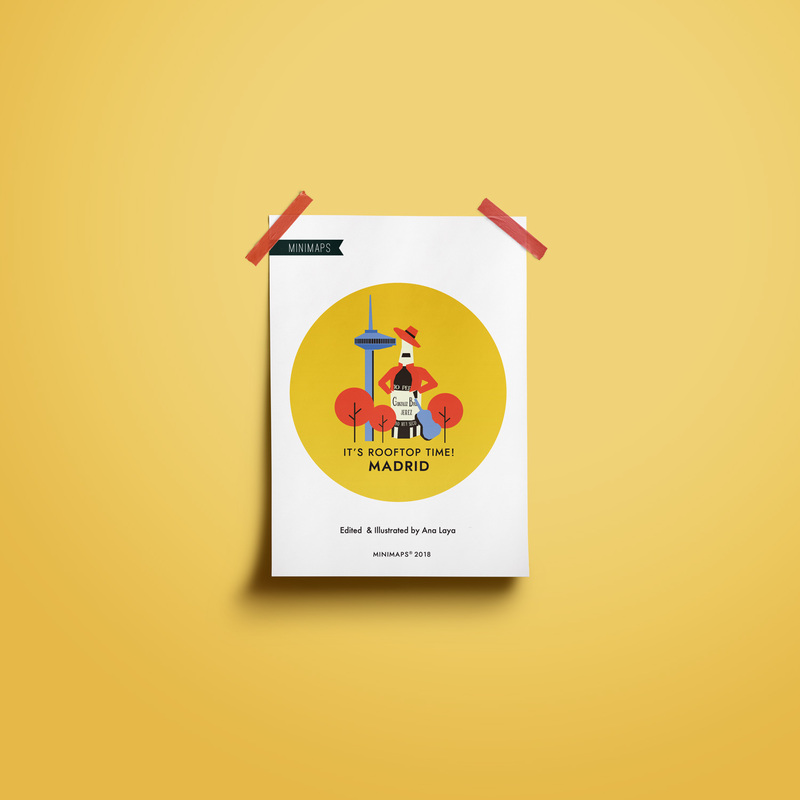 Ready to enjoy Madrid’s skies?